Big seabass in colder month. 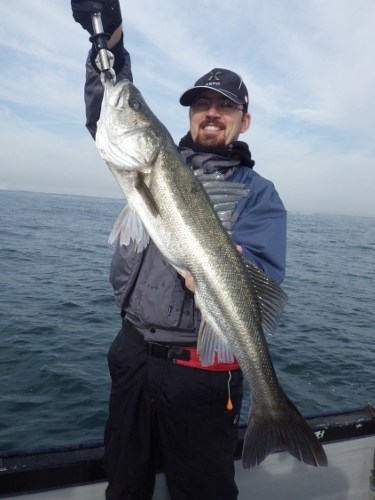 Early November into Early February is good time to target BIG seabass and December and January being the peak season. Fishing ground can be anywhere between 30min to as far as 2 hour away during this season, so longer hour trip (9 hour ~12 hour) is recomennded, but doable on 6 hour trip. Below is Muharrem Kurumoglu from Turkey with 84cm seabass on Dec 18th, 2012. His group booked with us on Dec 18~20, 2012. We fished on 18th and 20th, and 19th got canceled due to foul weather. We caught about 25 seabass on both days, average size being 70cm+ and biggest fish being 84cm. Muharrem was using newly released Jumprise Rowdy 130 and his catch was futured on jumprize website. Check out the Report # 237.